A lot of people have tried to ask a lot of concrete specialist to resurface their homes, but most of them aren’t satisfied. That’s why we came in. Our company, Wizcrete, provide services that will surely satisfy our clients. Most concrete workers leave poor quality work, they tend to work very fast because they don’t usually care about it. However, with our company, we will see to it that we deliver top quality work. We offer resurfacing of driveways, pool sides, and patios. Our company will see to it that we will resurface your home to your desired color and style, and we work to satisfy you. If our customer is not satisfied with the job, we will redo it until they will be satisfied. We have this Wizcrete visualizer which makes you see the before and after photo of your home. We will take a picture of your home and make all available options for the resurfacing of your home. In using the visualizer, select from the range of colors & patterns available from the website. Click on the color and pattern you selected. Email us the digital image of the area you want to resurface and give us an idea of the dimensions of the area you wish to resurface. Describe every detail and effects you want to have on the area. Provide us with your contact details and we will personally guide you through the options and give some recommendations. When we receive your order, we will use the visualizer to apply the options you have chosen. Within thirty-six hours, you will receive an email of the after photo of your home. Comments and suggestions are highly appreciated. Our company will constantly recommend options. Using the visualizer has no fees, which means if you decide not to continue availing of our services, we will not charge you a single dollar. Our company also gives a five year warranty for the resurfacing services we provide. During the five years, if the concrete will show any signs of wear and tear, Wizcrete will repair it with no extra costs. We offer the latest designs and techniques available. Our team members are not just ordinary workers that we hire. Our team members are professional resurfacers. A lot of our clients personally trust us because we have already received a number of recognitions and awards, which guarantees our clients that we will do our best because we have a reputation to maintain. Our company is based in Sydney, Australia. We aim to give every home a unique and magnificent look. Try us! Do you want to have that stylish look on your home? Try Wizcrete! 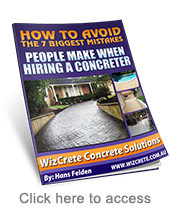 Wizcrete is a concrete solutions home facelift company that is based on Sydney, Australia. They specialise in giving your home a “face lift”. Each of the team members of Wizcrete are selected based on their professional experience and their work. They offer customers with the latest designs available using the latest techniques known today. They will complete the job with the style and colour that you selected within the time you have agreed with, unless there is a bad weather. Wizcrete will facelift your home until you will be satisfied with the result. If you happen to be unhappy with the job Wizcrete does, they will personally pay for another concrete specialist of your choice to finish the job just to satisfy you. Your concrete face lifting is packed with a five year warranty. Meaning, during those five years if your concrete surface shows any sign of wear and tear Wizcrete will redo to fix it at their own expense. They offer concrete driveways, concrete resurfacing, concrete stenciling, poolside designs, concrete patio designs, and stamped concrete. Wizcrete has the solution to almost all of your concrete problems! They have this Wizcrete visualizer which makes you see how your home looks before and after the resurfacing job. You will see the change by resurfacing your old concrete or replacing it. The Wizcrete visualizer shows the options available for the resurfacing of your home. May it be stenciled or patterned, colored or stamped concrete for the driveway, balcony, patio, or paths. You will see the after picture of your home within thirty-six hours of your order. You will be awed at how Wizcrete will enhance your home. When you order, Wizcrete will use their visualizer to work on the options available for your home. Within thirty-six hours of your order they will e-mail you the after picture of your home and they will demonstrate the big difference Wizcrete will make. Comments and suggestions are highly appreciated as Wizcrete will continue to provide their customers with a lot of options for their home until you will be satisfied. The goal of Wizcrete is to provide each home unique and magnificent looking patios, paths, driveways, and pool decks. The service is offered to customers on a “no-cost” and “obligation-free” basis! Improving your home has never been made easy! In times when first impressions matter more than anything, and time itself is of the utmost importance, even the most trivial choices have an impact on how you are perceived and how you are treated. One crucial factor is the house. The state of your house reflects the state of your bank account and your social position. However, many do not see past the first few things which include your lawn and your driveway. While the first is a matter of regular trimming, the latter is a little bit more complicated. The driveway has to endure a lot of wear and tear, it has to be safe for the children and ultimately it must be pleasing to the eye. Most of the time, these three qualities do not meet in one single product. Yet, Wizcrete has managed to successfully combine durability, safety and aesthetics in a range of concrete based products. These products, backed up by a warm and professional staff, will solve your driveway problem. The dull and grey driveway will be turned into the highlight of the neighbourhood and bring a splotch of colour to the yard. The choices to be made will have ample guidance and are cost effective. The difference between a cracked and ugly driveway and a modern and pleasant one is a matter of a hundred dollars depending on the current state of your driveway. You can opt between a facelift and a total makeover. The facelift is a good choice for driveways that have minor cracks but are otherwise sturdy. The facelift consists of a Wizcrete concrete coat which is applied on a thoroughly cleansed and prepared surface in order to create a long term bond. The surface is usable in the same day for foot traffic but washing and vehicles are not recommended for five days. In comparison to the makeover, the facelift has some advantages: it is the most time-efficient and it is less costly and has a fifteen year life expectancy if it is regularly resealed. The makeover is more costly and time consuming but the end result lasts even longer and cracks are less likely to appear if tension cuts are properly placed. The driveway can be designed just the way you like it. With Wizcrete, from different patterns made by stamping to a wide range of colours, the final product is guaranteed to meet even the highest standards.